Marine life and the nautical artifacts have an interesting connection with our childhood excitement and thrill embedded deep in our subconscious. Most of us are mesmerized by the chivalrous stories of sea pirates and their mystical ships, or dazzled by the nautical furnishings and instruments in elegant ships. Such nostalgic memories revive and fill our life with a renewed enthusiasm when we decorate our home with a nautical theme. 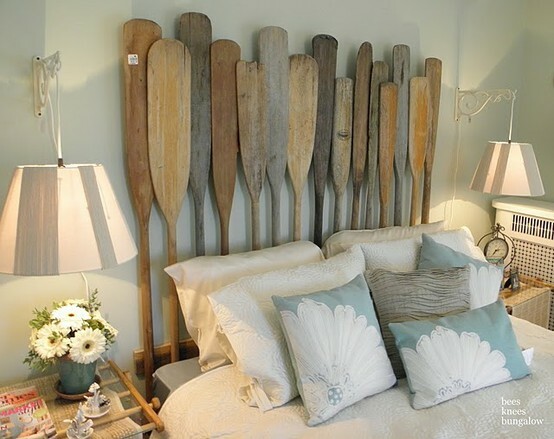 There are some great nautical home decorating ideas that can set the stage for transporting you into a state of fantasy. Nautical décor has something for everyone – your children will love the ship models and your guests will adore the nautical furnishings and the maritime instruments that fill the air with the charm of antiquity. Handcrafted Ship Models: As the most preferred choice of millions, ship models catch the fancy of almost everyone. Whether at home or in office, exact replicas of famous ships like USS Constitution, Titanic, or America’s Cup Model can sit pretty proudly on the cupboard racks or on top of your refrigerator, sofa side table, office table, or even on a window sill. You can have an assortment of various boat and ship models like sail boat models, cruise ship models, pirate ship models, or even ships in a bottle that are always a visual treat. Anchors: Though the anchor also has been a Christian symbol and signifies hope and steadfastness, it globally represents a nautical life. Use various forms of anchors at home as nautical decors such as aluminum anchor with cross bar, wooden rustic anchors with hook rope in different color schemes. You can display them on the walls over the hearth of the study room, or even outside the home main door as a door knocker! 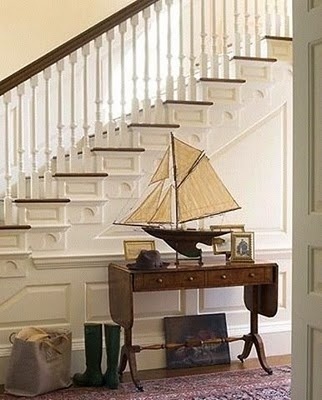 Nautical Liferings: It is not possible to have a nautical theme décor at home without a lifering somewhere on the walls. Not only does this nautical home decorating idea come in different color options, but is also available as antique lifering clocks and wooden liferings to fill up the big spaces on your home walls. Ship Wheel: Steer the course of your nautical theme in the right direction with the intricately carved helm or wooden ship wheels. Besides the traditional shades of brown, they are also available in black color as pirate ship wheels. 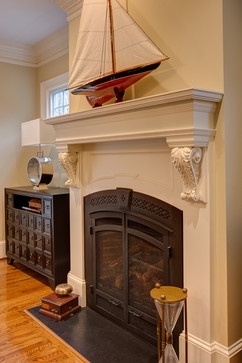 It is a good idea to hang the ship wheel clock centered above the mantle in the drawing or dining areas of your home. Porthole: Your nautical theme might look incomplete without a porthole mirror on the wall of your home. This circular nautical décor item has its own charm and gives the feel of a ship cabin. You can even have a porthole-incised door to add to the nautical taste or have a real porthole window looking over the swimming pool or the beach. 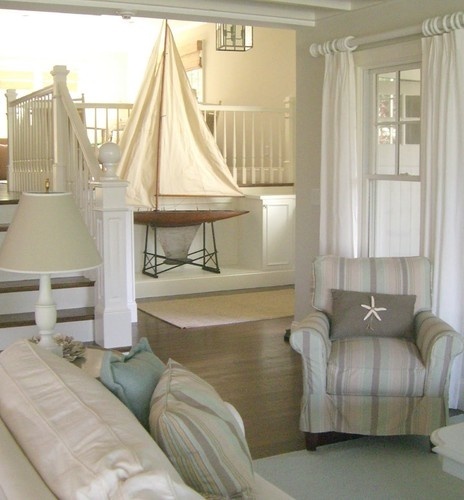 This is just the beginning of bringing the ocean and the nautical life into your home. The nautical home decorating ideas have plenty of more options and accessories that you may want to check out at GoNautical.com and bring home the feeling of being on sea.